A year before Amazon.com went online for the first time in September 1994, Long Island City served as the home base for a small Jewish website, as well as a proving ground for the potential of the Internet to serve as a unifying force for social responsibility worldwide. That site was Chabad.org. The social responsibility of massively successful high-tech companies was again thrown into high relief last week when Amazon announced that Long Island City—a working-class neighborhood in Queens, N.Y., that has been home to the largest public-housing development in the Western Hemisphere—would now be home to one of the tech giant’s major new headquarters. The move by one of the world’s biggest companies—owned by the world’s richest person, Jeff Bezos—promises to bring 25,000 skilled jobs to the city, solidifying New York’s ascendance as the next great tech hub, with $1.5 billion in tax breaks and incentives promised by the state. But it also highlights the growing disparity between the high-tech “haves” and the low-tech (or no-tech) “have nots,” as many observers in politics and the press have noted. In the San Francisco Bay Area, home to multitudes of companies known the world over, locals have long been rankled about the presence of tech-bros and posh startups that often attract wealthy residents, but leave much of the underclass behind. Private buses couriering programmers to mammoth corporate offices there have even drawn the ire of public officials. This summer, a proposed ban on employee cafeterias in new office buildings even gained some traction in the hopes that it would get some of those employees to patronize smaller-scale food establishments. 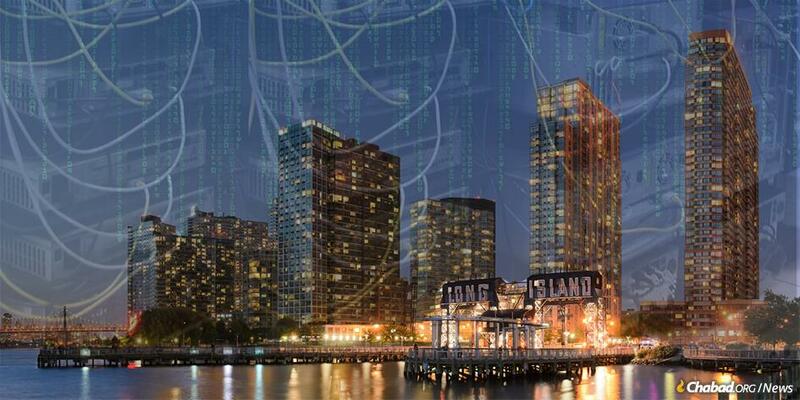 What is not known to many is that this is not the first time that Long Island City has played a critical role in the history of the Internet. In fact, the two came together 25 years ago during the Internet’s infancy. A year before Amazon.com went online for the first time in September 1994, Long Island City served as the first home base for a small Jewish website, as well as a proving ground for the potential of the Internet to serve as a unifying force for social responsibility worldwide. Chabad.org not only predates Amazon.com (and its briefly floated original name, Cadabra), but also such other early tech titans as Yahoo, eBay and The New York Times’ web presence. Launched in the fall of 1993, Chabad.org was one of the first 500 websites created after the birth of web in 1991. Amazon’s recent announcement just so happens to be timed to the confluence of two anniversaries: the 25th anniversary of Chabad.org’s launch in 1993 and the 20th yahrzeit (anniversary of passing) of Chabad.org’s co-founder and visionary leader, Rabbi Yosef Yitzchak Kazen, on 12 Kislev in 1998 (this year corresponding to Tuesday, Nov. 20). In the ensuing quarter-century, Chabad.org has grown to be the most popular and largest content-rich Jewish website in the world, reaching 50 million unique visitors last year. 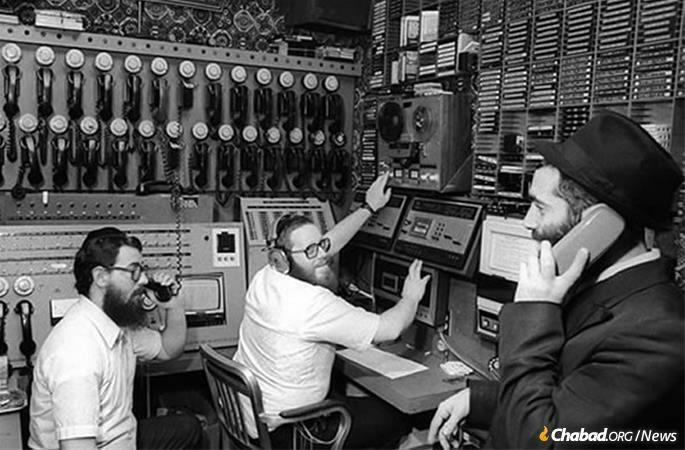 Rabbi Yosef Yitzchak Kazen, center, at at WLCC, Chabad’s telephone communications hub. In the summer of 1993, Rabbi Kazen—known affectionately as Y.Y.—was at the PC Expo at the Jacob K. Javits Convention Center in Midtown Manhattan. There, he met an individual from the Long Island City-based Dorsai Embassy—one of New York’s original Internet service providers, and a nonprofit dedicated to helping other organizations and individuals get online. Kazen, who worked at United Lubavitcher Yeshivah, was already familiar with the BBS system, the confederated network of “bulletin boards.” For the past five years, he’d been a regular contributor to Keshernet, the Jewish BBS, and had visions of further creating a dedicated Chabad presence online. At the PC Expo, he learned for the first time about the nascent World Wide Web—a project born at CERN, the European Nuclear Research facility in Switzerland in 1991. When Kazen returned to the Crown Heights neighborhood of Brooklyn, N.Y., he went directly to 770 Eastern Parkway (Chabad Lubavitch Headquarters) to visit his friend Rabbi Eli Winsbacher, who then worked at WLCC, Chabad’s telephone communications hub. “Yossel, you’re crazy,” said Winsbacher. 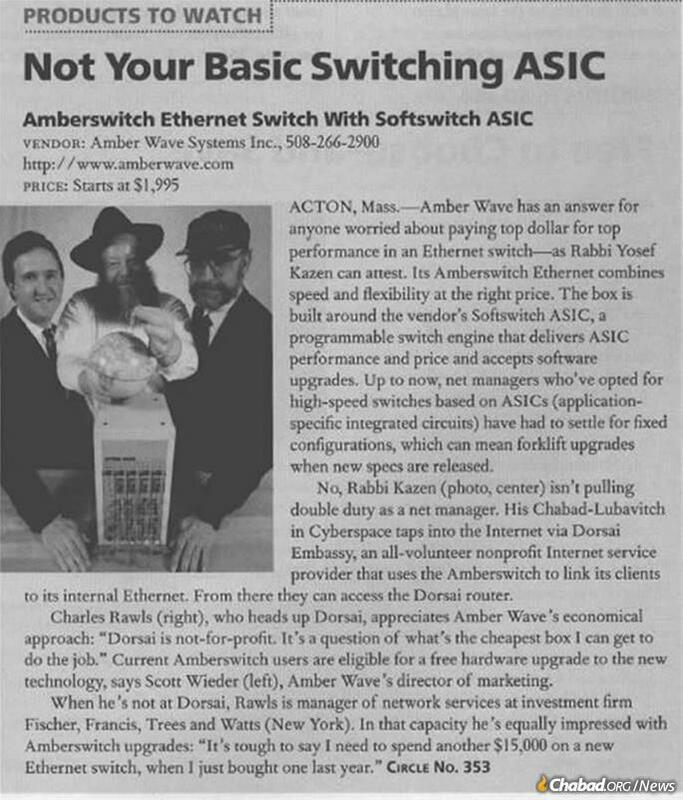 The pair quickly realized that despite Winsbacher’s technical prowess and Kazen’s vision, they would need a guide to navigating the Wild West of the early world wide web. Recalling that the Dorsai Embassy offered free classes on Tuesday evenings, Kazen and Winsbacher struck out for Queens. 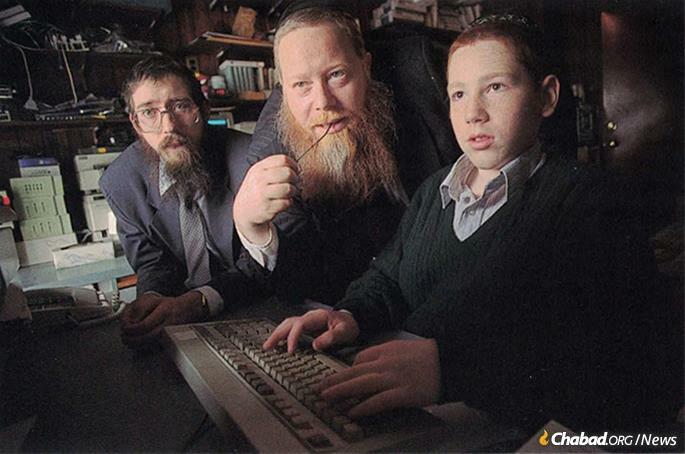 Eli Winsbacher, left, with Rabbi Kazen, and site webmaster Michoel Kazen, taken in February 1996. “We took our car and schlepped out to Long Island City for classes,” Kazen later recalled in a talk he gave to Chabad emissaries the next year. Before leaving, he told his wife, Rochel, that he’d be back in an hour. Besides being one of the original three Internet service providers in New York City, Dorsai served as a literal embassy to the web, helping organizations get online and training young people, especially from the neighboring Queensbridge projects, how to code. Tall, with a trim beard and a penchant for wearing snap-brim fedoras, Charles Rawls is one of the co-founders of the Dorsai Embassy. With the slightest trace of a Texan accent from growing up in a little town in the central part of the state, where “the ‘Welcome to’ and ‘You are now leaving’ signs are on the same post,” he still recalls that fateful encounter with a wry smile. Entering the Dorsai Embassy—a former washmat now filled with personal computers and servers, affectionately known as “the bunker”—the two Chassidim stood in sharp contrast to the computer hackers inside. Kazen and Winsbacher understood the immense potential in the web, with its ability to share information, images, even rudimentary audio and video. They hunkered down over the embassy’s computers and began to learn. Glancing at his pager hours later, Kazen realized that his one-hour trip had kept him out until 4 a.m.
Kazen would return many times, so much so that he was eventually given his own keys to the bunker. The two—soon joined by Dovid Zirkind and YY’s son, Michoel, together with the group at Dorsai—would go on to launch Chabad.org by year’s end. There is far more to their story, as there will be to the story of what will happen in Long Island City once Amazon arrives. Kazen in an early ad for Internet technology. What is clear, however, is the message that technology in a cement-laden sector of New York City—one often not traversed by Manhattanites— can teach Silicon Valley and the world as a whole that at its core, the Internet can be used to lift up people from diverse backgrounds (which is what Long Island City is all about) and help them achieve amazing, even G‑dly things. Rawls recalls that initial interaction as “pretty much an example of what the Internet should be about,” a tool to build bridges and connect people.